Read more about the bioavailibility of turmeric/curcumin HERE. You can also use the paste to flavor stir fries, stews, soups, eggs, veggies, yogurt and anything else that makes you happy. I also love to just eat it by the spoonful from the fridge. My dear friend added 2 tablespoons to her iced coffee the other day, and it was out-of-this-world crazy good. Feel free to leave out the honey if you will be using this for savory applications. You can add a titch of sweetener to each cup of Golden Milk as you make it. Transfer to clean glass jar. Mixture will thicken as it cools. Place lid on jar after mixture has completely cooled. Give a little shake to prevent separation and store in fridge for 2-3 weeks. The sweetener is totally optional. I think honey is the perfect addition to round out the flavors of this delicious paste. Feel free to omit it if you like. You can still make Golden Milk with it. Just add a titch of sweetener to your spiced milk. This paste should stay good in the fridge for 2-3 weeks, especially if you use a clean spoon every time you dip into it. I also like to sterilize my jar before using it. To sterilize jar: Preheat oven to 200’F. Place clean glass jar, without lid, on oven shelf for 10 minutes. Turn off oven and put lid on jar and leave in oven to cool. Do you have a favorite way to eat turmeric? I just made the Golden Milk Tumeric Paste and it did not turn into a paste, more like a gravy. I see that it is thickening while it cools. I like the taste and can’t wait to have some this evening with Almond milk. Thank you for the recipe! Yes, it thickens while it cools. Give it a nice shake before you put it in the fridge to prevent separation. Enjoy! Can the paste be frozen without destroying its properties? Another recipe online recommends freezing if you won’t use all the paste in 2 weeks. That said, I’m in love with the recipe and warm golden milk. I confess that I tripled the cinnamon and love the natural sweetness that results. I prefer to use fresh whenever I can, do you think this paste would still last in the fridge if I made it using fresh turmeric paste instead of powder? Its important to use good quality organic turmeric powder so you get the full benefit from the active contents in the powder. Some ordinary varieties have the active content taken out so it doesn’t do anything! Thanks for the recipe! How much paste/milk would you recommend using when making golden milk? How much of the paste do you use to make a cup of Golden Milk? I’m wanting to make some tumeric paste for myself and my dogs and love the look of yours with the extra spices. Sounds delicious ? Do you know if this one has been used with dogs? Most of the dog ones are just turmeric pepper and coconut oil. A friend of mine recommended this recipe for my dog, she has a very rare cancer. So I’m going to give it a try ! What if I do not have ginger or cardamom? 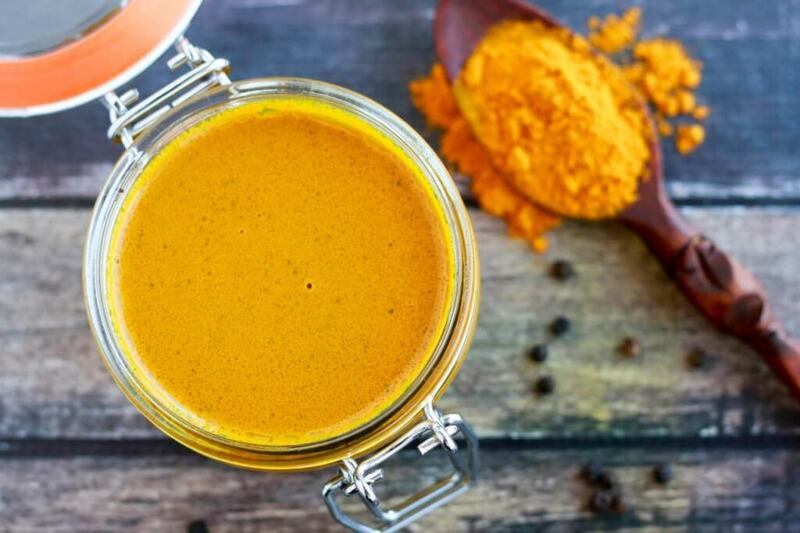 Golden milk traditionally has turmeric, cinnamon, cardamom, pepper, and ginger. Without the ginger and cardamom, you could still make a paste, but it will not have the same flavors. You could try to see if you like just the combo of turmeric, cinnamon, and pepper. lol as soon as I added the coconut oil it turned NEON YELLOW! and it won’t incorporate. what did I do wrong?? lol!! I made this recipe today, ❤️❤️❤️! Thank you for the tip to leave on the counter to cool before refrigerating! ?? I have chronic IBS issues and am also bariatric (gastric bypass). Tumeric belps me in so many ways! I have to watch my sugars, so I opted to leave the honey out… REALLY good without it ?. Thank you s recipe!! In search for a Tumeric Paste recipe that I lost, I ran across yours. Without even making it yet, I can tell I’m going to love it. I’m not commenting to contradict your recipe, but I am writing in repsonse to the comment about the coconut oil hardening on the top after refrigeration. The first recipe I used called for adding the coconut oil when you were actually making your drink. I added a heaping teaspoon to each cup of “tea” I made. That is also when I added the honey. Sometimes I would sprinkle the top with a little nutmeg just to dress it up a bit. All that being said, I’m definitely making yours, though. I like having it all made up and ready to go. Can this be frozen for increased storage life? Hi, Gary! Good question! I have never tried freezing this. My guess is that you totally could freeze it in small ice cube trays for easy use. I’ll have to try it with my next batch. I made this yesterday and followed ingredients carefully. shook the jar very well. it did not thicken, and Coconut oil settled on the top. I still used the liquid added to warm coconut milk and it tasted OK.
Any suggestions as to why it didnt thicken? The paste is already pretty thick when you pour it into the jar. It thickens slightly in the fridge as it cools due to the coconut oil. I am thinking maybe you did not cook it long enough. Once you add all of the ingredients, it is pretty runny. You cook it until it is like a thick paste (but not sticking and burning to bottom of pot.) I then add the fat and honey. You want to stir stir stir until it is well incorporated. Be patient. It will come together. And allow to cool completely before placing in fridge. If I have any separating at all once it cools, I simply just mix it well before placing in fridge. Hope that helps. Aloha from Hawaii! I just made this paste and it looks great. It is more like a thick gravy after adding the honey and coconut oil but I see no reason why that would make it less beneficial, right? It was more like mustard before I added those. This is my birthday present to myself to drink this every night! Thanks and if I have any questions I’ll be back! I ended up putting my mix in my nutri bullet and made sure the coconut oil mixed in well, put in back in jar and in the frig. It is a nice thick paste now. This is great, I was wondering if I was using too much paste in my milk, so thanks for information. I am using about 1 and 1/2 tablespoons and it tastes perfect. After a cup of the warm golden milk I go right to sleep no more need for melatonin. Has helped my spinal inflammation since becoming paralyzed. Came across this website and enjoyed reading it. I am from Goa, India but am settled in Brazil. Reading your article on tumeric, I have fresh tumeric and use it in my daily cooking when I make curries or cook meat. When I have some time to spare on weekends I many times make a dish called PATHOLYOS using tumeric leaves folded containing a rice flour batter filled with grated coconut , jaggery and raisins and steamed in a boiler. The cooked tumeric leaves impart a lovely smell on the cooked batter. Just made this for the first time. It smells wonderful and the consistency is perfect. However, it is far from “golden”. More like baby+prune juice. How do I correct this next time? We have a daughter that suffers from a mental health condition caused from inflammation in the brain. We decided to try this to see if it would help… unbelievable results almost immediately. This is the third night and already It has helped her get the sleep she needs and seems to have already helped her anxiety symptoms subside. Thank you for sharing. I am so happy to hear that. It’s so hard to see your children suffering. Sending lots of healing vibes your way. May she continue to heal and thrive. This recipe looks great! I am getting the ghee & cardamom today so we can have it tonight. Do you use 1/2 coconut oil & 1/2 ghee for taste or health reasons? I am signing up on your website to see what else you have in natural health & wellness. Wish I would have found this beforei used all the my tumeric ..
You can add this paste to any food that you like. 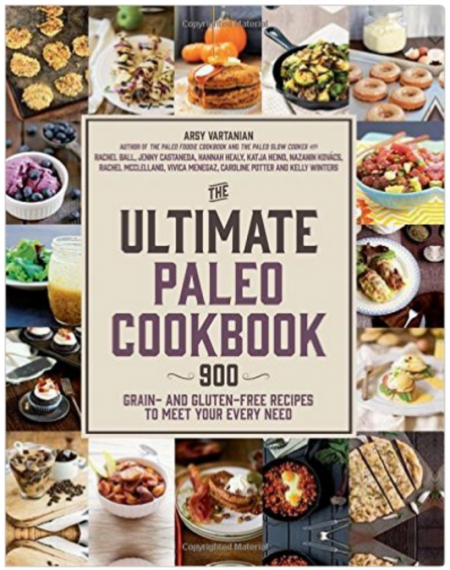 Eggs, soups, stir fry, curries, toast, chia pudding, etc. You could freeze it and swallow it if you wanted. It does not have to be heated. I like this recipe because of the consistency. I’ve used other recipes of just water, tumeric and pepper, then you’re supposed to add oil and honey when you use it. It was so thick it would not disolve in milk when I used it. This is great! Why do you have to cook the tumeric? I found you recipe after deciding to make paste instead of golden milk for long term use. Can you use Vitality Black pepper EO, Cardamon EO and Cinnamon bark EO in place of the powder spices? Of course, they would have to be added after it cools a little. NO! Do not substitute EOs for the dried herbs! As a reference, a drop of peppermint EO contains as much peppermint as 300 cups of tea. EOs are very very strong. DO NOT INGEST! I meant “comparison”, not “reference”. I eat 3 tablespoons of ground flax seed every day to increase my omega 3 intake. Any reason why I should not add turmeric as well? Turmeric is the best! So good for you! Do you know how much paste this recipe makes? Trying to decide on what size jar to use. This recipe makes about 2 cups. Enjoy!! 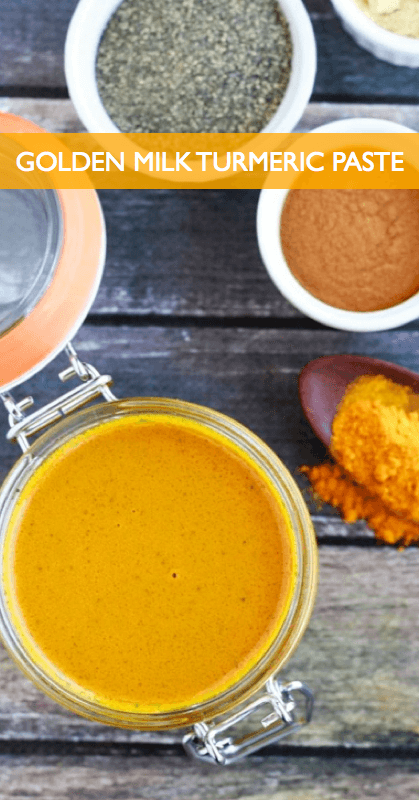 Isn’t 1/2 cup of turmeric powder too much? I have never seen a recipe for turmeric paste with this much turmeric in it. No, that’s what I use. This recipe is mainly turmeric and 1/2 cup works beautifully. 🙂 You can certainly half the entire recipe if you don’t think you will use the entire batch in 3 weeks. Great recipe! I also add hot pepper seeds and I freeze half to use when I am done with first half. Is there a health reason to add honey or is it just for taste? I like it unsweetened. Honey is just for taste. You can leave it out. Freezing it is a smart idea. Manuka honey s very good for the immune system. Look it up. Honey is not just for taste, but is not antiinflamitory like turmeric is. Honey has tons of minerals and enzymes as well as immune boosting properties. It is less effective when heated to higher temps so I leave it out of original paste recipe, adding it to my mug just before consuming. I’ve made turmeric paste before, I will never run out. I love it. My question is my next batch of paste I have only 1/8 cup of tumeric, could I add curry or ginger to replace the rest of turmeric? It won’t be the same consistency. You would have either a curry paste (which has way less turmeric) OR a VERY gingery paste. I would just wait until you get more turmeric powder. I had the same result, watery. Never thickened into a paste. Maybe cut water in half next time? I should also say that it cooled overnight in the fridge with minimal separation mixed throughout. Thank you for the reply. I’ve been using it and it seems to be doing what it should. Plus, I enjoy taking straight or as a drink. I like the flavor. I bought something like this from a local from time to time, but making it costs a fraction of the price, so I end up being able to take it more regularly. Plus, doing it on my own is fun and empowering. Thanks again for sharing your recipe/process. i was a bit distracted when i was making this recipe, and did not let it cook and thicken enough before i added the coconut oil… do you think i could try reducing it again, or should i just leave it alone at this point? thank you! ? Hi, I made this turmeric paste, but I definitely didn’t let the mixture cook and reduce enough before I added the fat and let it cool. It’s still extremely soupy, even after being refrigerated, and has this intense chalky quality…it’s actually a bit hard to swallow. I would like to know if you think I can try cooking the mixture a second time, to see if it will reduce and incorporate a bit more. I’m not sure if heating it again will be an issue since it already has the coconut oil mixed in. Thank you for the recipe! If you didn’t cook it down enough, it just means it has more water in it. You should still be able to dissolve it in hot liquid. It will dissolve easily and be just fine. 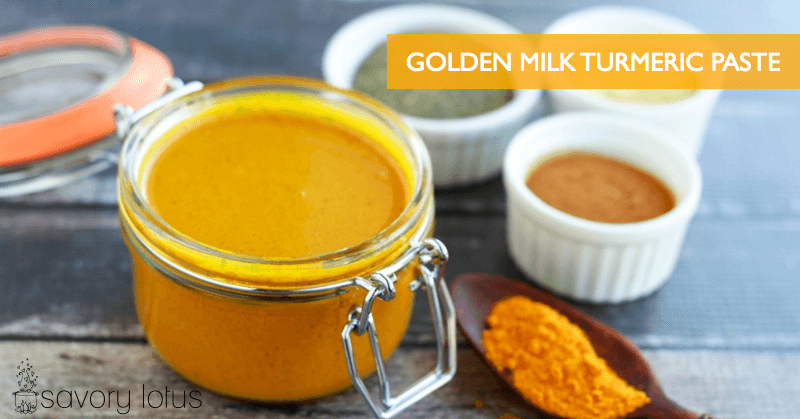 Many folks add the straight dry spices right to their milk when making golden milk. This paste just makes it much easier. Fantastic recipe, thank you. Just put some of the paste with solid of the coconut milk to make ice cream. Would be fabulous with pistachios. Mmmmm…. pistachios would be fantastic! I think i added to pepper is this a problem? Sorry…. I do not understand your question. I think she meant too much pepper? Tasty! I left out the honey, next time I will leave out the salt (I hardly ever salt anything). I put 2 T in 12 oz of raw Jersey milk. Tomorrow I will try it with my kefir. This recipe is wonderful! I would give it a 10 if I could. I had no problem following your recipe and it turned our perfect. I love adding the cinnamon and cardamon to the tumeric paste which makes it easier and faster when preparing the golden mild. I’ve been drinking this twice a day and once even used water instead of milk. Love love love!! Can’t wait to treat my friends to this wonderful beverage. Thank you! Yay! I am so glad that you liked it. I drink it almost every day! It’s my cozy, before bed drink. Just curious. Why does this need to be refrigerated since all the ingredients alone do not? I refrigerate this because once you add water (moisture) you create an environment for spoilage. Bacteria likes wet, warm places to grow. I have not tried this recipe, but I have salicylate intolerance (I get severe hives and sometimes asthma) and spices are high in salicylates so I won’t be trying it. Wish I could. Hi Katja. Thank you so much for sharing your recipie. I had been trying different recipies for a while now to get one to my liking & this was perfect! My husband & I love it! We both have more restful sleep, better day concentration & energy. I also saw your comment about adding to coffee, and plan on trying that as well. I am intrested in hearing if anyone has had success freezing and/or traveling ideas. Hi, Amy! So glad you like the turmeric paste. I drink it regularly. I usually don’t travel with my paste as I don’t want a big mess, but I have just mixed up the spices and taken that with me. I haven’t tried freezing it. My paste turned out thin and oily…what might I have done wrong? It is still delish and after stirring works well but I was expecting a ‘paste-like’consistency.Thanks for reply..love your site! Is there a special coconut oil. I used ciscro coconut oil and the next morning there was hard chunks of coconut oil What did I do wrong. I had to reheat to disperse the oil again. I have to say that this is one of the best tumeric paste recipes out there! LOVE that you incorporated ginger, cardamon, cinnamon , salt ( the touch of salt makes a great difference, softening the slight bitterness of the tumeric) & black pepper ( I used 1 tsp of black pepper in paste- I like spicy! My paste turned out perfect. Followed your great directions. I use almond milk to make golden milk. But my favorite thing to do with this paste is to make an awesome spiced tumeric tea. I put 1 1/2 cups purified water in pan, with 2 tablespoons of your wonderful tumeric paste. I toss is about 5 cloves , whisk to stir paste into water. Cover & bring the tea to a simmer, turn off heat, add 1-1 /2 tablespoons of lemon juice, 3 tsp erythritol, 1/2 tsp stevia Glycerite. Stir &Cover and let sit 5 min. Strain and drink. Tastes almost like homemade Christmas spiced tea – a very healthy version with all the benefits of the Tumeric, ginger & black pepper ! Love this! HI, Kim. Yay! 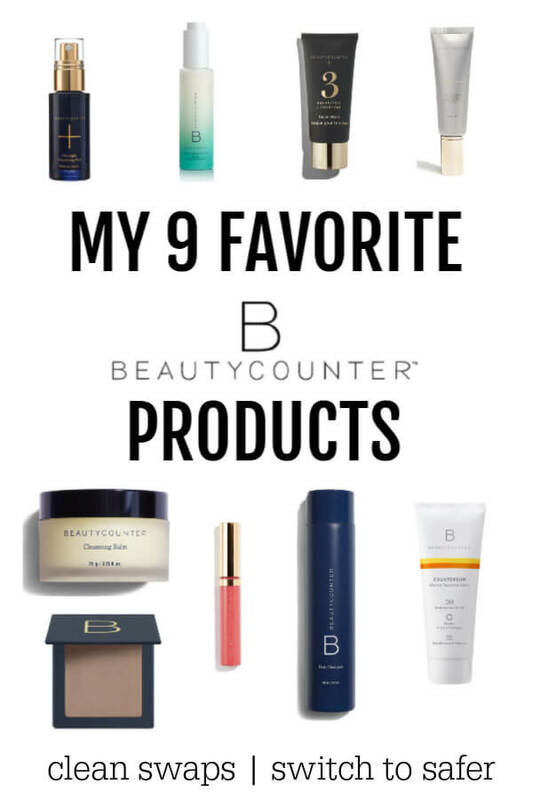 I am so glad that you love this turmeric paste. Your tea recipe sounds wonderful. I am going to have to try it. Hello Katja: If I was to use only dry ingredients and ghee, would I be able to store the jar outside of the fridge? I’m trying to understand why it would need refrigeration. I have used this recipe and add a bit more spice to it, pepper wise, for a savory option. I make a sous vide CDB coconut oil for this. My arthritis pain in the morning is gone. 1 tsp in the AM with vanilla almond milk, same before bed. Life changing!!!! Hi, are the quantities for black pepper, cardamom and cinnamon in the recipe given in terms of whole spices or powder? Worst recipe ever!! I followed exactly, no substitute. Never turned into a paste. Hi, Samantha! I am sorry to hear that you are having trouble with this recipe. And that you feel like it’s the worst recipe ever. It’s actually one of my favs. I make this every few weeks and have never had trouble getting it to thicken into a paste. Once the turmeric and spice thicken, I add the oil. Yes, you will have to stir in a lot to get it to come together, but it always does if you are patient. I am trying to problem solve without seeing what happened. The only thing that would make it not come together once you add the oil is if you allow the mixture to cool too much. The fat has to melt into it. I’m happy to answer any questions so I can help figure out what is happening. This really is a wonderful paste to have in the fridge, I promise. I realized after that I forgot the salt. Could I add a touch of salt to each cup when I drink it? Great recipe. My toddler son really likes Golden Milk so I thought this recipe would be a good idea. First cup was a success—even without the salt! He enjoyed his yellow moustache as well? You can just leave it out. Or just stir a titch of salt into the paste. That’s to awesome that your son likes Golden Milk. It’s such a good thing to have on a regular basis. Hi! Thank you for this. Do you think it would act different with goat milk for the golden milk? I can not have cows milk. You said your friend put it in iced coffee and it was delicious but how can that work when the oil would congeal??? Hi I’m new to this but I really want to give it a go, do you go for all ground ingredients ie cardamom,cinnamon etc? Made it twice now, and love the flavor. Much better than the golden milk I bought from Whole Foods and from a local restaurant. And a whole lot cheaper. I can make 2 weeks’ worth for the price of 1 cup from the restaurant. The first time I made it, it never got to a paste consistency. I think your recipe has too much water in it. It was fine until I added the additional 1/2 cup of water. The second time I made it I did not use the additional 1/2 cup of water, and it turned out fine. I upped the pepper to 1 tsp…I love the spiciness it adds..
Can I use 95% curcumin instead of tumeric? If so would I consume the same amount that you suggested (2 tsp) in my milk? There is no hard and fast rule on how much to consume. I would use the paste to taste- mixing in what tastes good to you. Hope that helps. I just made this and it feels so fatty. Have you tried it with less coconut oil. I cooked it more than twice as long as you suggested because it wasn’t thickening. It turned into a nice gravy, but once I added the coconut oil it became really greasy. I shook it well and added it to coconut milk (before it cooled) and it tasted so fatty. What are your thoughts? So, I love this recipe! However, I’ve been questioning whether or not I’ve composed it correctly! Does it call for a 1/2 cup of each, ghee and oil, or a 1/4 of each; combined at a 1/2cup? How often is too often to consume this in one day? If I have a tbsp or two in a mug of almond milk in the morning and night, is that okay? Can you actually eat too much of this? Totally fine to have this a few times a day. No worries. Enjoy! Does this have to be refridgerated? Yes, it stay good for a few weeks if you use a clean spoon every time. Would it be beneficial to add ginger? If so how much would you recommend? Why would my golden milk paste be brown? Hi, Earle. I really don’t know why it would be brown. Turmeric is a nice golden color. I wonder if it might have something to do with the turmeric that yu used. Or did it burn? I love this recipe! I have 2 questions. My paste is a little gritty. Do I need to cook the paste longer? Before or after I add the spices. And, I love the spices used in your recipe. In most recipes that call for these spices, I double the amount called for. Is it okay to do that with this recipe as well? I also add about 1/4 tsp of cloves. Is that okay? Mmm… So easy to make and really tasty! Followed the recipe and it’s still very thick after adding the coconut oil. I didn’t add salt or honey, but the cardamon lends a fragrant lovely flavor. Just made my first golden milk this evening. I’m going to have to do this nightly. Thanks for the wonderful recipe! Hi! I used all of the ingredients in my Vitamix. Some of my spices were whole. The Vitamix has no issue pulverizing the spices to a powder. However, since there is no reducing method with the Vitamix, only a warming up of the mixture, I believe this recipe has too much water for this method. Next go, I will cut the water by half and see if it sets to a paste. Side note: wear an apron for any splashing, and my Vitamix canister now looks like a neon yellow highlighter- which may be a turn off to some. For me, it just gives me fond memories of trying new things. I am very new to the health benefits and terrific taste of the Turmeric Golden Paste. I am really enjoying trying out the various ways of using it. I am currently waiting for knee surgery and after only a week of using the paste, I am now not taking any pain killers and I am confident that I am going to be able to continue working; something that I was worried about. I love your Turmeric Tonic; I make it every morning, I substitute the coconut water for my home brewed kombucha, it tastes terrific. That is wonderful to hear, Gerry! Natural remedies for the win! Happy healing!! This is my favorite golden milk recipe so far! Turning all the ingredients to a paste really seems to help it not taste as chalky as other recipes, although I do usually find a big deposit of silty spices at the bottom of my cup still. It also saves time and makes it easy to make up a cup to drink rather than combining the spices reach time. I used half almond butter half coconut oil, and have used both Maple syrup and agave nectar to sweeten. I think I’m going to try adding some vanilla as well. I haven’t had a problem with it being too watery, it seems like my tumeric and water mix thicken up almost instantly. I imagine people with thickness problems probably don’t have the heat high enough, or aren’t using good quality tumeric…? Yay! I love love golden milk. This is my fav way to make it. Glad you enjoyed it. Great recipe. I whisk a Tbsp of the paste into my saucepan of milk to get a frothy consistency. I always seem to get residue that settles in the bottom of my mug. Is that normal? Frothy sounds so good. Yes, it’s normal to have a bit of spice residue at the bottom as the spices settle. I am so happy to hear that. your milk combo sounds delish! I make this recipe regularly. I’ve never had an issue with separation – I stir and shake the paste relentlessly while cooking and cooling. I do not add any sugars or sweeteners and enjoy it stirred into hot water and topped with coffee cream. I use high quality, organic spices and oil. Thank you for sharing this fabulous recipe! THANK YOU soooooooo much.I have made your turmeric paste exactly as you instructed and it is PERFECT it is DELICIOUS to drink.I can not thank you enough.